Psalm 23:1, 3 The Lord is my shepherd, I shall not want……He restores my soul. What peace and grounding there is to be found in the first psalm I ever remember learning. Thank you, Cousin Terry, for reminding me of the rest and assurance that is available to all believers! We were catching up over the phone. In response to my question of how she was doing financially (she lives on a fixed income), she confidently recited verse 1, that she lacked and desired nothing due to our shepherding Lord. After we hung up, I savored recalling each truth and promise packed into those six verses of the 23rd psalm. I’m a sheep. As a simple beast, I don’t have the vision or the wisdom to know where to find green fields and clean, refreshing waters. I need a GOOD shepherd. Yet most of the time I operate as though I know what is best for me and where I should head. The shepherd knows me well. After all, He is MY shepherd. That means I am HIS little sheep. I belong to him. And Jesus knows best how to take care of me. I act like a foolish beast when I don’t trust Him and His provision. If I don’t have the thing I think I need or want, then that something is not what I should have at the moment. In fact, I will NEVER not have what my maker knows I need. Restoration is a big deal. The Hebrew word shuwb (#7725 Strongs) refers to life-giving actions that my Shepherd performs, namely….RETURNS, REFRESHES, STRENGTHENS, REPAIRS, CONVERTS. So often I’m scattered, distracted, worried, headed off on an unhealthy tangent or plan. I NEED a wise and good shepherd who knows best and doesn’t hesitate to perform holy restoration/restauration. What Jesus, my Shepherd, repairs and restores is what the Old Testament calls the soul, or nephesh (#5315 Strongs). For the Hebrews, nephesh represents the entire YOU. Your immaterial feelings, thoughts, pleasures, desires and dreams as well as your material or physical self. Does that include my disappointments? what about my ‘yet-to-be-realized dreams’? And my shame? YES! Does that include my energy and desires, my ‘get-up-and-go’ as my Dad used to call it? In a word, YES! This master shepherd CAN and DOES guide, provide, love, encourage, feed, console, motivate and protect me in just the right amounts and combinations at the most kairos or propitious of times. So with just 1 verse and a fragment, the Psalmist answers my anxiety. God is always communicating a message of rest, of peace, of provision. My life is not as complicated as I make it out to be. And I bet yours isn’t either. 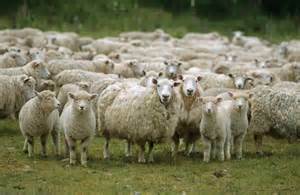 After all, if we are Christians, we know we are just sheep, senseless and stubborn at times, but well taken care of. Aren’t you glad our Shepherd is committed to us? What do you do when your belt gets tight? My husband has extolled belt wearing for years. Being cinched in provides instantaneous body awareness. My spiritual Belt of Truth provides the same corrective feedback. 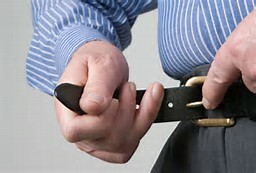 Each morning as I don battle dress, I linger over that Belt of Truth, Jesus’ filtering grip designed to allow only true beliefs in my inner being. But it’s not uncomfortable. No, Jesus proffers His ‘inner-self support’ as relief from the chains we would otherwise wear. But Jesus has promised a much lighter load, crafted to fit comfortably, one that He Himself promises to bear, provided we stay attached to Him. Despite starting the day with the correct belt comfortingly reminding me of Jesus’ presence, by noon I was squirming, aware that something was pinching. Sitting at my computer, finishing schoolwork from the previous week, I fretted over personal tasks and NOT ENOUGH TIME! That false god called “Enough Time for Maria” was competing with the Almighty for supremacy. I caught myself grumbling while resenting time constraints. Snap! Ouch – my Jesus Belt tightened. What made my belt prick? 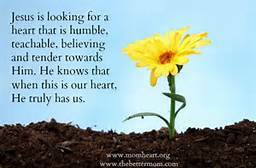 I had allowed ‘unbelief’ into my core to dilute my happy trust, contentment and peace. Once I confessed and trusted God’s promise of sure forgiveness, my Jesus Belt felt comfortable again. Thank you, Father, for giving me such a life-saving Belt of Truth. 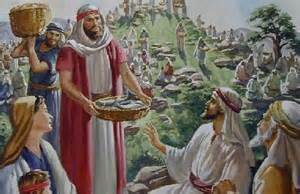 The King was a praying man, after all hadn’t Zechariah mentored him well from God’s word? And as long as he prayed for favor in Judah’s battles against the Philistines, the Arabs and the Meunim, his armies prevailed. His and Judah’s successes became the talk of the world that even the Ammonites paid tribute, aka protection money, rather than fight. 16 But when [King Uzziah] was strong, he became proud to his destruction; and he trespassed against the Lord his God, for he went into the temple of the Lord to burn incense on the altar of incense. The rest of the story is pretty dramatic. The priest in charge, Azariah, confronted the King, reminding him with a strong rebuke, that God forbade anyone but the priests from burning incense in the temple. 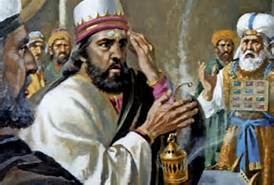 As King Uzziah exploded into rage, incriminating censor in his hand, leprosy broke out on his forehead. In hindsight, it would have been better for Uzziah to continue in his daily dependence on God’s strength, rather than crave his own strength. His desired independence, what he thought would make him happy, led to his downfall. I’ve been thinking a lot about some of my assumptions when I pray. At the bottom often of my anxiety is the fear that God is going to withhold what I want, what I know/think will make me happy. Isn’t there always something we are asking God for, something that will make us more content, happy, complete, and peaceful? But what if we are wrong in our assumptions? Mike and I have started watching Frank Capra’s classic, It’s a Wonderful Life. In this 1946 Christmas movie, George Bailey has finally earned enough money to take the trip of his dreams. He longs to break out of the claustrophobia of his small hometown, positive that the wide world holds what he wants. But the unfortunate timing of his dad’s death delays the trip. One set of unexpected circumstances leads to another, until he is maneuvered into staying put in Bedford Falls, the very future he worked hard to avoid. His unrealized dream of travel, to be followed by college and then a profession of building modern structures never materializes. He had always projected certainty that his version of the future was best for him. Apparently his dad had repeatedly expressed hope that George, as oldest son, would accept his offer to take over the family’s Building and Loan Association. 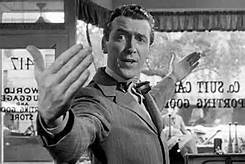 In an offhand remark that wounds his dad, George dismisses 40 years of laborious efforts to secure loans for many of Bedford Falls’ working class families. This is not the career or the life that George wants. You can watch the movie again, if you have forgotten what George learns in the end. But what I realized in thinking about King Uzziah and George Bailey was that often our assumptions about what will make us happy are not correct. Why? Because when I think about X, I picture a more content Maria. God alone knows what will make me happy/content/’better off’ as He defines it. What if what I THINK will make me happy, my X, actually is bad, dangerous, painful or somehow disastrous for me? After all, isn’t God omni– good/loving/knowing/powerful/wise/holy/giving…..
Why should I think that I know best? that what I think I want IS best? So, are we not to pray for what we want? Are we just supposed to resign ourselves to….being miserable? When I think of how to be upright, I picture myself looking UP at God, and not at what I want. I don’t have enough information to know what is best for me. I’ll still ask God and pray for what I want, but I’m learning to hold those requests loosely. What is your experience in wanting something really badly and then finding out it was NOT what you thought or (worse yet) it turned out to be harmful? That was me – Wednesday, Thursday and Friday nights. Couldn’t turn off my mind from pursuing one thought after another. Nothing bad, just the possibility of another job for next year. And it wasn’t a sense of joyful anticipation that fueled my thoughts, but a chewing on the pros and cons. Relief finally came via reminders of Truth. 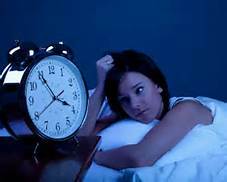 When I woke up Saturday morning REALLY tired despite lying in bed for 8 hours, the Holy Spirit gently chided me that I had failed to take advantage of Almighty God’s loving command to cast all my cares on Him. Christian Community provided more light on what was True. Anne and Wes were here for the weekend. Listening to Anne describe her thought process on one of her issues (and what turned out to be a lie she had swallowed) helped me see some presuppositions I, myself, had accepted as Truth. As it happened for Anne, finally admitting to a trusted Christian friend one of her ‘facts’ (aka – an unsubstantiated belief), she was able to see, in the light of day, what her friend was able gently but rationally to point out. Her account of thinking incorrectly helped me to look at what I had accepted as fact. Listening to Anne gave me pause. Maybe not ALL of my assumptions are true! Maybe it’s irrational to compare myself to the best in my field. 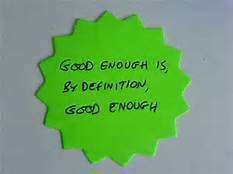 Maybe my ‘good enough’ is sufficient for God’s purposes where I am. Maybe where I am has less to do with teaching/educational work, than with being present for my ‘neighbors’ in my daily community. One new thought prompted another as Anne shared from her life. Maybe Satan is the source of some of these assumptions in order to discourage me from investing energy in my work life. Hm – that hadn’t occurred to me. I default to believing that my thoughts have their origin in me. And maybe it’s not about being good enough, or the best or wildly enthusiastic. Maybe it’s about being faithful today, where I am, with what I’ve been given to do. And to do IT with His power and wisdom and energy. Working backwards, I reasoned thus: Since I know that I have been adopted into God’s family and am a co-heir with Jesus, my brother, then ipso facto, the Spirit DOES lead me. The Greek word is ‘ago’ (Strongs # 71) and it can mean COMPEL, DRIVE, BRING. Much stronger words, then ‘lead’, wouldn’t you say? If God is sovereign, then I can trust Him to drive me or keep me where He wants me. And concerning this other job possibility I WILL turn over the next card and do what is at hand, this day, but I will pray to remember NOT to pre-occupy myself with the future.